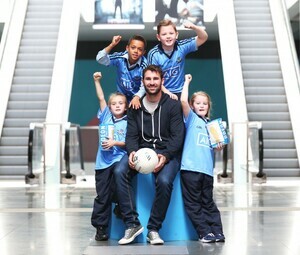 Former Dublin GAA captain Bryan Cullen at ODEON Cinema, Point Village with Morgan Freeman Savannah Keogh, Summer O Callaghan and Charlie O Reilly from St. Audoens NS, Dublin 8. ODEON cinemas will screen the GAA Football All-Ireland Senior Championship Final on Sunday where Dublin will take on 2014 All-Ireland Football Champions Kerry. The closest ODEON Cinema for Kerry fans is ODEON Limerick, 113km away while there are four ODEON Cinemas in Dublin at Blanchardstown, Coolock, Point Village and Stillorgan. “Screening the GAA Football Final and Hurling All-Ireland Finals in ODEON Cinemas nationwide is a fantastic way to soak up the electric atmosphere for those who can’t make it to Croke Park on All-Ireland Final Day. We hope GAA supporters and their families will take advantage of this unique opportunity and come and enjoy the entertainment and skills of our great game of football on the big screen on one of the biggest days in the GAA calendar”. To celebrate, we have two FAMILY passes (4 tickets x2) to an ODEON cinema near where YOU live to literally give away. To enter, just provide a title for the the greatest GAA movie ever…. Lines MUST close at 12NOON 2.45pm 4,45pm. Posted in Misc and tagged ODEON cinemas at 9:14 am on September 11, 2015 by Broadsheet. …hooray…just been offered a premium level seat because of a cancellation! I can go on with this you know…. The Movie Where Bryan Cullen Repeatedly Threw Away Damien Sheridan’s Tee, Preventing Him From Taking A Kick-Out As Longford Were Chasing The Game In Extra-Time Of The 2008 O’Byrne Cup Final. That’s a TV show, otherwise I’d have your back on that. They’ll eat you without salt. The Gooch, The Brick, Alan Brogan and His Brother. The final isn’t until the 20th? The GAA, the Bad, and the Ugly. Is that the one with Macaulay Culkit in it? 12 Years a Mayo Fan. i’m running thin now. i’ve never been to an all-ireland final, and at this stage it looks like i’ll have to give marty morrissey a hand-shandy to get a ticket. Cloudy with a Chance of Wide Balls. If you have to explain it….. The Truth about The Cats and Dubs. The Boy in the 2-Striped Jersey. Sent back with his beard from 500 years in the future to stop horrible fashion trends from arising. He must stop the evil computer bi-net which swings both ways, towards bad and good fashion…. I know that was the name of a terrorist organisation, but it would make a cool name for a movie where Al Qaeda tried to blow up Croke Park on All Ireland final day, only they didn’t take into account Brian Corcoran coming out of retirement to lead Cork to their 31st title by scoring 6-15 in a 6-16 to 0-2 win over Kilkenny while foiling the terror plot at an unusually long half time period with only his hurley and wits. The sequel can go along a similar plot line only he’s up against Isis and he does the same thing 2 weeks later and helps Cork get their 3rd double. Streetwise Hercules, picking winners tonight.